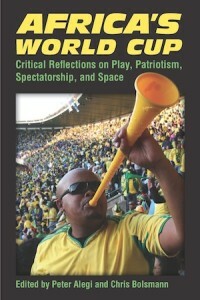 FSF members from four continents convened online on October 24 for a lively discussion of Africa’s World Cup: Critical Reflections on Play, Patriotism, Spectatorship, and Space, a new collection edited by Peter Alegi and Chris Bolsmann. With the editors and several chapter authors in attendance, the group considered the book’s attempt at blending scholarly and journalistic approaches, as well as the process of writing, editing, and publication. 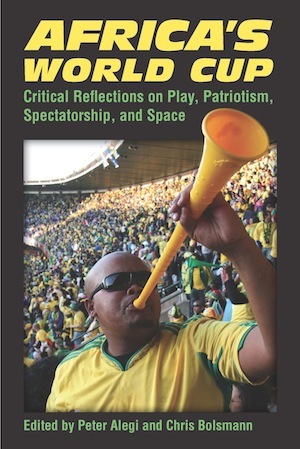 A fruitful comparison between South Africa 2010 and Brazil 2014 put the spotlight on how the FIFA World Cup is entangled in a web of national and international politics, economics, and culture. There was also a fair share of debate over Luis Suarez’s handball (against Ghana) and the contradictory legacies of this “African” World Cup. , Jordan Pearson, Sean Jacobs, and Alex Galarza (all via Skype); and Liz Timbs, Dave Glovsky, Alejandro Gonzalez, and Peter Alegi (in East Lansing). For a Storify Twitter timeline click here, with special thanks to Liz Timbs (@tizlimbs) and Laurent Dubois (@Soccerpolitics). The audio recording of the discussion is available here.